- Monitor as many web pages, blogs, news sites, forums, etc. as you like. My WebSpy will auto-crawl them all on a regular basis and alert/notify you of any changes/updates. - Specify My WebSpy's crawling depth. This is best explained in an example. - Web page changes, updates and modifications are highlighted in yellow. Don't waste your time comparing old and new web pages, trying to figure out what was changed or updated. Removed content is highlighted in red. 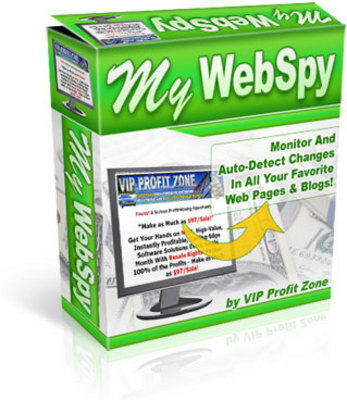 - Schedule My WebSpy's monitoring/crawling activity. In other words, you decide how often you want My WebSpy to check any web page; every minute, every hour, every day, every week, etc. It's up to you. - Manual, on-demand checking of one or more web pages. - Edit the settings of one or more links of web pages you're monitoring. - Sort the list of web pages that have been 'modified' based on Name, URL, Modification Time, Number of Changes. - My WebSpy launches at Windows startup. 1. Microsoft Windows 95, 98, Me, 2000 or XP.